If Peter Pan had grown up, he might have been slightly concerned about flying in anything other than a hermetically-sealed airliner, especially if he’d found himself in a light aircraft with no doors, as I did on a scenic flight over Malta, Gozo and Comino. The only other time I’d flown in an aircraft without doors I’d been somewhere over the Swiss Alps with a group of friends doing a parachute jump. 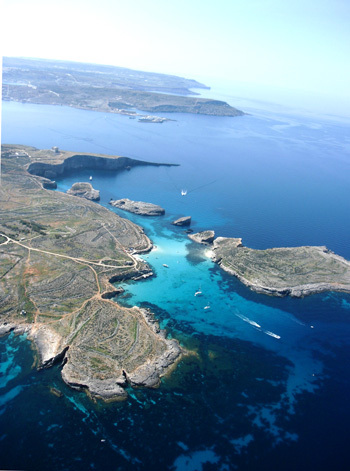 My pilot for this flight over Malta was unconcerned though about the lack of doors as we headed off, rising over the west coast past secret beaches between cliffs that seemed to flake into shallow waters, and over the furthest tip of the island’s ‘fish-tail’ northern coast. The only thing between me and the Blue Lagoon below was the fresh air colliding with my face at 100 km an hour. The advantage of not having doors hit me in a different way as well though; the view from this plane wasn’t limited to a pocket-sized world glimpsed through a hole-in-the-fuselage window over a stranger’s shoulder. Of course, this plane didn’t come with any of those commercial flights’ little luxuries, nor for that matter a smile at the check-in desk. When you arrive at the airport gate for a light aircraft island tour, you’re greeted by a soldier who demands to see some sort of identification, then mispronounces your name and asks you to sign in. Once security decides that you’re not a threat, you are driven to the hangar and given the grand tour. Decorating the hangar walls are route maps, posters of aircraft and flight-related notices seemingly there to reassure passengers that light aircraft companies and pilots rigorously follow flight regulations, just as their commercial jet counterparts do. After the mandatory pre-flight checks, we’re all set for take-off. Once in the air, the plane starts to bounce. This is when the seatbelt sign would light up on your typical Airbus A320. I’m not a fan of turbulence in a regular jet, let alone in a plane weighing less than 450 kg. I look around foolishly for the emergency exit sign, but there isn’t one. From 2000 feet above ground, the reason the Blue Lagoon got its name becomes evident. ‘Do you want to get another look?’ asks my pilot. ‘Sure,’ I reply. 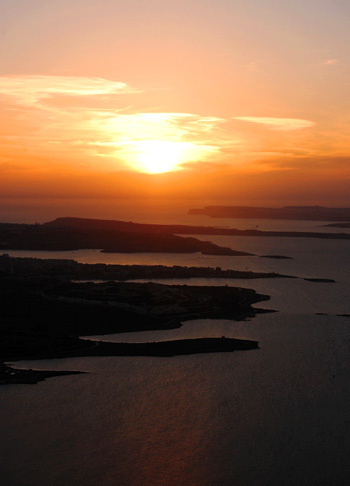 He swerves the plane steeply to the right, the passenger’s side, getting a little closer in order to give me a 360 degree view of the Comino. All I had to do was not fall out. As we level out again, the man on the radio says something muffled only pilots seem to understand. My pilot translates the garble saying that there’s another aircraft close behind us. I look towards where the rear view mirror hangs in my car, but there isn’t one of those either. I ask my pilot why aircraft don’t come with mirrors. ‘Yes, mirrors would come in quite handy. But they’d probably fall off with the wind.’ I look uneasily towards where the doors should have been. With hindsight, this was quite foolish of me really because there is in fact an easy, sophisticated way of spotting aircraft which are in the vicinity. No, there’s no radar on lightweight aircraft. The suggested method is to stick your head out the plane and look around. This, coincidentally, is the same technique used to check fuel levels on longer trips to Sicily. Then, above the blue haze of the Mediterranean Sea and the reddening clouds attempting to hide the sun, we make out a small distant shape. Level with the sun, we watch as the island drowsily slumbers under the protection of the orange skies. Up here, all that can be heard is the hypnotising sound of the propeller, and the occasional muffled voice. Beneath me the toy cars go on with their business, unaware that Peter Pan might be flying somewhere high above them. There’s no need to watch an in-flight movie to derive enjoyment from this flight; the pleasure is outside the plane, below in the magical toy world. It’s a surprise to me that there aren’t more tourists lining up to catch a flight from which they can take photographs of all the major sights from higher than the roof of a hop-on-hop-off tour bus – something made easier by the lack of side doors. We approach Valletta where I know my father is anticipating my fly pass. We circle over what looks like a scale model of St John’s. I see the cathedral’s internal yard for the first time. Between the symmetrical structured buildings, I can just about make out a hand waving in the air. Moving the plane quickly left and right, we wave back. Flying depends greatly on the weather and the heat, so the best time to book your flight is early in the morning or late evening during the Summer months. Identification is necessary to gain access into the airport, but no passport is needed unless you’re planning on crossing international borders. coast of Malta to see Popeye Village and Golden Bay, the Blue Lagoon, the Azure Window and Dwejra in Gozo and the Grand Harbour. If your aircraft is open air, then it can get quite cold once you’re in the air, even during the summer months. Dress warmly to avoid discomfort. Like all other flights, do not bring any prohibited items into the airport. You’re not allowed on the airport ground if not guided by a permit holder. Don’t walk around the airport grounds unattended or you risk getting arrested. Each aircraft’s permit to fly and each pilot’s license are renewed yearly. There’s also no need to worry if you are flying in an ‘open’ aircraft, as you are belted in! Giulia Bugeja is an MA student of English and the Media at the University of Malta. She researched and wrote this article for an assignment on blogging. Giulia flew with Buzz Flight Training who form part of Island Microlight Club (IMC) and provide trial flights at very reasonable prices. Their website has more information. Prices vary according to the amount of time you choose to fly. Yes, I’ll get some info from the author on which company she flew. I think several do the trips. Could you share some details on how you can book such a flight? Cost? It sounds amazing!